Osama bin Laden, a fugitive both isolated and connected. At the outset it may seem that the story of the capture of Osama bin Laden was patently non-digital. He was located because the CIA put more agents on the ground in Pakistan. A crack Navy SEALs team killed him in his compound, notable for its lack of Internet or landline phone connection. It was clear that bin Laden wished to keep off the digital grid and that he understood very well that any digital contact he had with the outside world could be used to locate him. Yet, for a man still operationally connected to an international terrorist organization, total digital disconnection was impossible. He relied on human couriers, but those couriers were transporting digital content: thumb drives, CDs, and DVDs. Bin Laden held the digital world at a remove, but only by one degree of connection. The courier whom he was living with not only transported disks and thumb drives to others in his network (a classic “sneakernet“), but also communicated by mobile phone. It was these calls that allowed investigators to learn that the courier was in Abottabad. …American intelligence analysts are just beginning to pore over a huge trove of computer files, storage devices and cellphones that the commandos recovered from the compound, [and] they were eager to release the new videos, five in all, on Saturday. 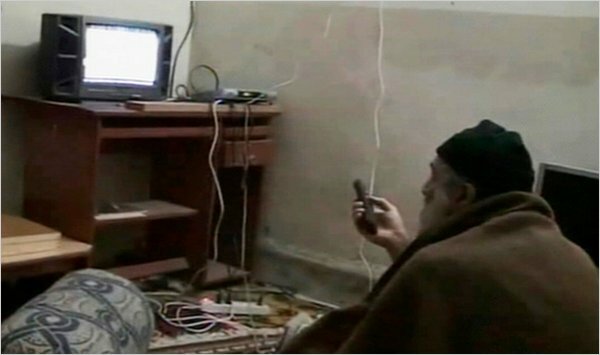 One of the most haunting images from those videos is one of bin Laden watching himself on TV in a sparse room (above), representative both of his isolation and of his continued connection with world events. Even the world’s greatest fugitive could not completely protect himself from revelation through the digital world.